We did themed food too. We called the red punch ''blood'' and garlic dip was Vampire's Demise! LOL!! And I decorated cupcakes to look like mini vampires!! Thought I would post these up since I had so many hits on my New Moon invites. 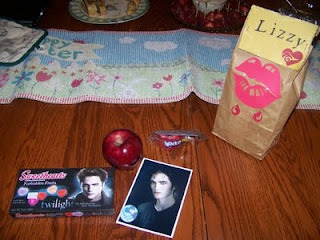 Perhaps I will be motivated to do something for the New Moon movie event I am going to. I forgot to mention the cricut carts used: Plantin Schoolbox for font, Indie Art for lips & heart.